The International Association of Unmanned Vehicle Systems estimates that small, commercial drones will create 70,000 jobs and have an economic impact of more than $13.6 billion in the first three years after their integration into U.S. skies. Recently proposed commercial drone regulations constitute a landmark step and promise to bring the U.S. closer to realizing the benefits of drone technology. However, by focusing on safety concerns, the draft rules raise obstacles to some of the most anticipated potential uses of drones. In this context, the U.S. drone industry must turn towards innovation as a means to move forward despite the regulatory limitations it might have to face. Federal R&D tax credits are available to assist drone designers and manufacturers in this quest. On February 15th, the Federal Aviation Administration (FAA) presented its draft rules for commercial drone flights. The proposed regulations constitute a long-awaited starting point that should pave the way for thousands of U.S. businesses to fly unmanned devices. However, the agency’s rules raise obstacles to activities that could represent some of the most innovative and lucrative applications of drones, including package delivery. FAA’s draft regulations require unmanned aircraft pilots to obtain special pilot certificates, stay away from bystanders, remain in the line of sight of the radio-control drone, and fly only during the day. They limit flying speed to 100 miles per hour and the altitude to 500 feet above ground level. In some aspects, the rules are less onerous than expected. For instance, they do not require that commercial drone operators attend a flight-training school and obtain a certification similar to that of a manned aircraft pilot, which involves medical tests and extensive flight hours. Instead, it proposes that operators, who would need to be at least 17 years old, pass an aeronautical knowledge test and be vetted by the Transportation Security Administration. This simplified certification process would benefit several potential users. On the other hand, however, the proposed rules impose major obstacles to certain drone applications. By establishing that operators would have to keep drones within eyesight at all times and prohibiting them to fly over people not involved in the operation, the regulation significantly limits the distance drones can actually fly. In the words of Michael E. Drobac, executive director of the Small Unmanned Aerial Vehicle Coalition, the requirement of visual contact with the aircraft "means we really are not talking about unmanned aerial vehicles. We are talking about something that has to have a person. It defeats the whole purpose." The FAA acknowledged the limitation and suggested that some of these flights could be made possible with a secondary spotter working with the pilot of the drone. While the use of a second observer could work for short distance flights, the delivery of packages with unmanned aircrafts systems, which has long been envisioned by retailers such as Amazon, would remain impossible. The draft regulations, which spent several years in the making, must undergo a process of public comment and revision before becoming definitive. According to the FAA, the proposed rules constitute a framework that will evolve based on a dialogue with industry representatives and future technological developments. The draft FAA rules have the primary objective of maintaining the current level of aviation safety. Major concerns include the fact that unmanned aircraft systems have limited capacity to “see and avoid”. Additionally, the connection between the operator and a drone can be broken, causing the aircraft to fly away until it loses power or collides with something. Cases of flyaway drones hitting buildings or getting stuck in trees have recently surged. Near-misses with passenger planes have also caused great alarm. In 2014, the FAA received an average of 25 reports per month of drones sighted flying near manned aircrafts or airports. The agency is open to reviewing and loosening its proposed regulations as drone technology evolves. In this context, R&D efforts aimed at enhancing safety in unmanned aerial vehicles gain vital importance, particularly the development of reliable sense-and-avoid mechanisms and highly autonomous systems. Innovation and technological developments will pave the way for the American drone industry to take off. With huge growth prospects, the U.S. drone industry faces an exciting future. Despite the regulatory obstacles in the way, it must move as far forward as possible in advancing commercial drone applications. The following sections present four possible pathways into the new era of commercial drones. As of right now, the FAA has in place a near-ban on commercial drone flights. However, exemptions have been issued under a provision adopted by Congress in 2012. Under the so-called Section 333, the agency can approve drone use for companies capable of demonstrating the safety of the proposed operations. The first permit for an unmanned commercial aircraft to fly over U.S. soil was issued in June 2014. The waiver authorized the use of drones to survey oil company BP’s pipelines, roads, and equipment at Prudhoe Bay, Alaska, the largest oil field in the country. In September 2014, six movie production companies were granted waivers to use drones while filming scenes in the U.S. They gained permission to fly small, unmanned aerial vehicles carrying cameras on closed sets. These exemptions represented a huge step for the film industry. Before then, companies wanting to use drones had to do their shooting in other countries. In October 2014, waivers were granted for four industrial companies - Trimble Navigation Ltd., VDOS Global LLC, Clayco Inc. and Woolpert Inc. They sought to perform surveying, construction site monitoring, and inspections of petroleum-industry equipment using drones. From January 6th to February 10th, 2015, the FAA granted more authorizations than ever before. A total of sixteen waivers were issued to a wide variety of purposes, including agricultural analysis and precision agriculture, high-resolution aerial imagery, bridge inspections, aerial photography and filming, and real-estate photography and videography. Until the proposed regulations become final, FAA officials plan to continue granting waivers on a case-by-case basis. About 300 waiver requests are pending and new requests are being submitted almost daily. The recent surge in authorizations is great news for those planning to file a petition under the Section 333 of the FAA Modernization and Reform Act of 2012. In addition to submitting a petition for exemption, candidates also need to apply for and receive a civil Certificate of Waiver or Authorization (COA). The petition for exemption must describe how the proposed unmanned aircraft operation will be safely conducted to minimize risks to the national airspace and to persons and property on the ground. Additionally, it must describe the procedures designed to ensure that the aircraft is in condition for safe flight, which could consist of pre-flight inspections, maintenance, and repair. According to the FAA’s Section 333 Guidance petitioners should allow at least 120 days for the processing and reviewing of any exemption requests. The FAA’s proposed rules represent a major step for the drone industry as they pave the way for various commercial uses and, consequently, open the door to a huge potential market. Drones can lower costs, give access to data previously unavailable, and provide a multitude of aerial images. They constitute a revolutionary tool for the planning, operation, and monitoring of projects. Under the proposed regulations, several industries will be able to benefit from drone technology. Construction companies, for instance, can use unmanned aircrafts to map projects and monitor progress with unprecedented accuracy. In real estate, drones can be valuable marketing tools, as they provide high-quality, aerial images of properties. Agriculture is also a very promising market for drone applications. The technology has become ubiquitous at farm shows across the country and demand should grow considerably under the proposed regulations. Colorado-based drone startup Agribotix is already preparing for the upcoming boom in agricultural uses of drones. Their product is equipped with a camera that snaps a high-resolution photo every two seconds. From there, the company stitches the images together, sniffing out problem spots in the process. Access to this sort of information can help farmers be more proactive in fighting diseases and insects. It would also enable precise, targeted treatments that focus on problematic areas instead of the entire field. The draft regulations would also favor the use of drones by utilities and energy companies. Unmanned aircrafts would reduce the costs and risks involved in certain utility operations, particularly in the case of patrols and inspection of high-voltage electric transmission lines, gas lines, and rights-of-way. Throughout the energy sector, drones could be used for purposes such as inspecting wind turbine blades for defects, detecting malfunctioning solar photovoltaic panels, scanning of oil and gas pipelines for leaks and structural weaknesses, and inspecting flare stacks at oil and gas operations. Several other countries, including Canada, Denmark, and the U.K., are more lenient with drone rules and already use them for various commercial uses. When it comes to package delivery, for instance, drones have successfully - and safely - delivered all kinds of goods all over the world. Chinese e-commerce company Alibaba recently performed a three-day trial of drones delivering ginger tea from its Taobao online shopping site to customers in Beijing, Shanghai, and Guangzhou. In Germany, DHL has used a drone called a "parcelcopter" to deliver medicine and other goods to an island in the North Sea. In June 2014, a pizza shop in Russia started delivering its orders by drones as a means of speeding up customer service. Domino’s U.K. has also tested a similar service, using its DomiCopter. In a South African outdoor rock festival in August 2013, drones were used to drop beers by parachutes. Customers placed orders using a smartphone app, which registered the position of users via GPS. Then, drones zoomed 50 feet above their heads and made the delivery. The American drone industry must capitalize on these successful stories. International data proving the viability of certain drone applications could play a decisive role in persuading U.S. regulators into adopting more progressive rules. On February 17th, the Obama administration announced it would begin allowing sales of military unmanned systems to some friendly and allied countries. The policy change comes at the end of a two-year review. The newly published standards require “end-use assurances” designed to make sure that armed drones will be used legally and responsibly. Lockheed Martin, Raython, and Northrop Grumman are a few examples of drone manufacturers that should benefit from the expansion in overseas markets. Figure 1 below illustrates some of the drones now being integrated. FAA’s proposed rules limit many potential drone applications, including package delivery. Meanwhile, the American unmanned aircrafts industry lags behind international competitors, which benefit from more tolerant regulatory environments. The burden of unfavorable regulation not only undermines American competitiveness, but it sends innovation elsewhere. Paul Misener, Amazon’s vice president for global public policy, suggested that the company might launch its Prime Air delivery service first in other countries with more accommodating rules. “We are committed to realizing our vision for Prime Air and are prepared to deploy where we have the regulatory support we need,” he said. Unfavorable regulation has also caused drone development to outpace regulators. In March 2015, Amazon received approval to test fly its delivery drones in the U.S. however, that drone has since become obsolete for Amazon. Paul Misener says, “We’ve moved on to more advanced designs that we are already testing abroad”. The FAA’s has approval of outdoor testing for Amazon’s drones will allow Amazon test their drones in a more realistic setting as opposed to lab tests and help bring them closer to their 30 minute delivery initiative. Amazon’s drone testing will have to abide by FAA’s guidelines which restricts testing over 400 feet and limits tests to the daytime. The FAA will also require Amazon to provide a monthly report on conducted flights, software malfunctions, and other data. In addition, the FAA has proposed rules that would require companies to operate drones only within eyesight. After years of a near-ban on commercial drone flights, FAA’s proposed regulations are a long-needed starting point. 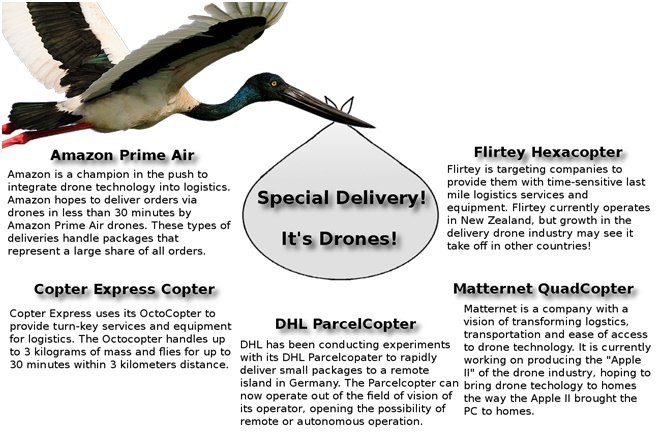 However, they raise significant obstacles to some promising uses of drones, including package delivery. Thankfully, the proposed rules are not definitive and will be open for public commentary once published in the Federal Register. It is crucial that those engaged in drone R&D take part in this dialogue. The U.S. drone industry must turn towards innovation as a means to enhance the safety and autonomy of unmanned aircrafts and persuade regulators of the viability of beyond eyesight drone applications. Federal R&D tax credits can be a strategic ally in assisting drone companies determined to move forward.